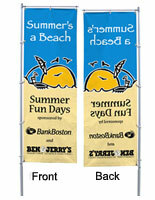 These Banners and Flags Employ Three Colors to Develop Bright Promotional Displays! Advertising Fixtures, Similar to Outdoor Feather Signs, Can Boost Sales! 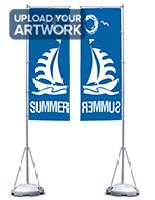 Go Online to Find the Banners and Flags that Will Increase Your Profits! For artwork featuring photographs or gradients, please see digital print option. 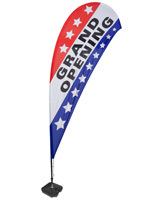 These banners and flags are entire sign sets that offer TriPole stands and triple-color, single-sided custom prints. The outdoor flagpoles are 13' 1" high, allowing them to be used successfully at carnivals, street shows, live concerts and other public events. 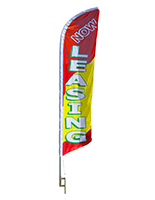 These banners and flags, like feather signs, are intended for use with the provided 31-1/2"w by 94-1/2"h displays. The towering outdoor stands supply a unique means of promoting goods, publicizing sponsorship or marketing new brands. Custom banners and flags are professionally made to endure the elements, yet they also serve as fine interior solutions! An inventive facet of these promotional displays is that they only necessitate one person for setup. These banners and flags are equipped with telescoping flagpoles made from aluminum that collapse for dense storage. 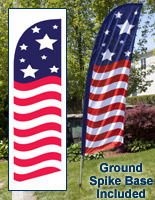 Graphics can be secured to the flagpoles while at the ground level. Then each segment of the pole is moved up and locked in place. The horizontal armature keeps signs taut and visible to passersby. 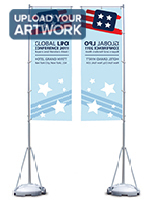 This flag arm also pivots with the wind to manage wind gusts while simultaneously creating attention-grabbing movement for viewers. At the bottoms of the flagpoles, there are 3-leg supports mounted to plastic polymer bases. Each base can be filled with water or sand to enhance the unit's overall stability. The bottom support also fits effortlessly into the provided carrying bag while in transit. 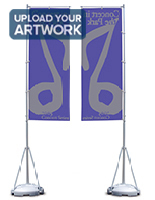 These banners and flags are 3-color feather displays designed from your artwork or logo. The submitted emblems are printed onto a durable knitted polyester fabric with our silk-screening process. Though the graphics are printed to only one side, the heat-transfer technique permeates through the fabric resulting in a reversed image on the opposing side. Due to the fact these signs are printed with a silk-screen procedure, a 10-unit minimum quantity is required. When relocating the displays, implement the enclosed carrying bag to lighten your load! 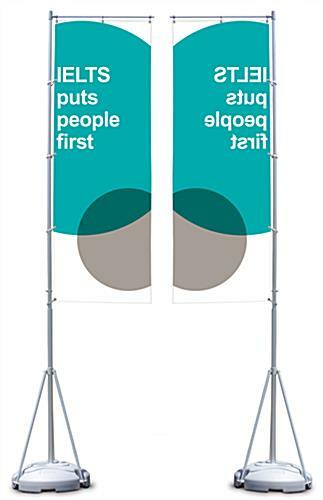 We are proud to offer signs for these TriPole banners and flags. We have researched many different options and have come up with a solution that we feel is best and most reasonably priced. These are real flags that will blow in the wind, not heavy vinyl banners. Although they are not the most inexpensive pennants you may find, with proper care and use they will last for years without fraying while maintaining their radiant colors.